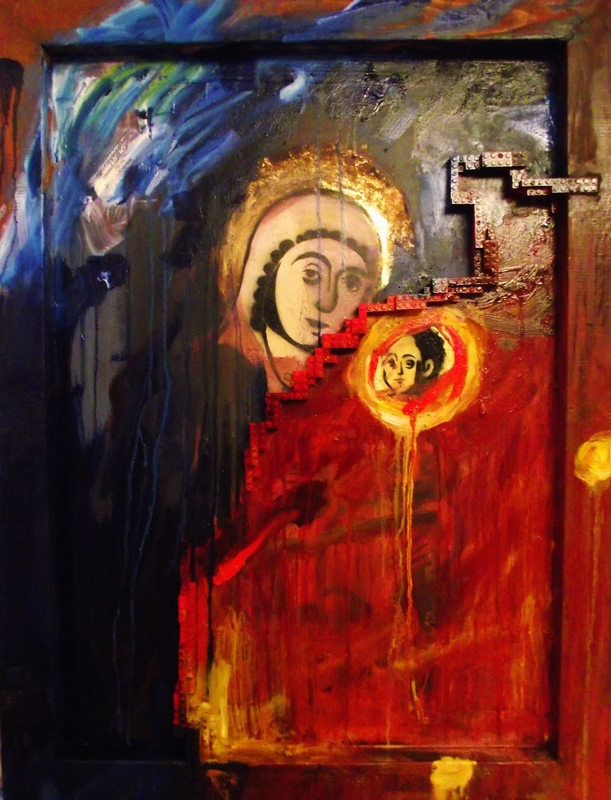 For the week running up to Christmas at 35 Chapel Walk we are holding an exhibition which focuses on the stories we hear about Bethlehem, 2000 years ago and in 2014. For most of us the events of Jesus’ birth and the current situation in the city are distant in time and space. All we have are the stories we hear; some are hopeful and some are heart-breaking. 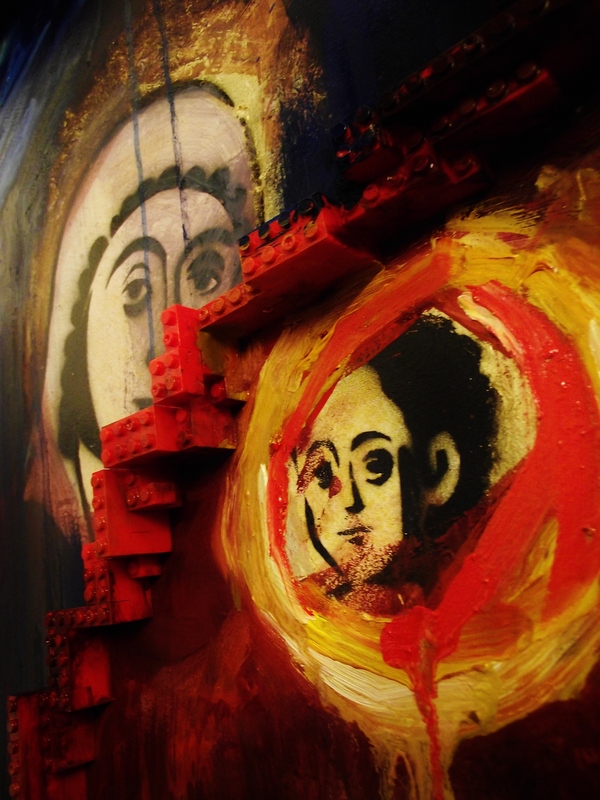 The pieces I have made for the show are based on an icon of Mary and Jesus from the Church of the Nativity in Bethlehem. Painting over this foundational image I have begun to dig deeper into how the stories I hear from Bethlehem impact my soul. 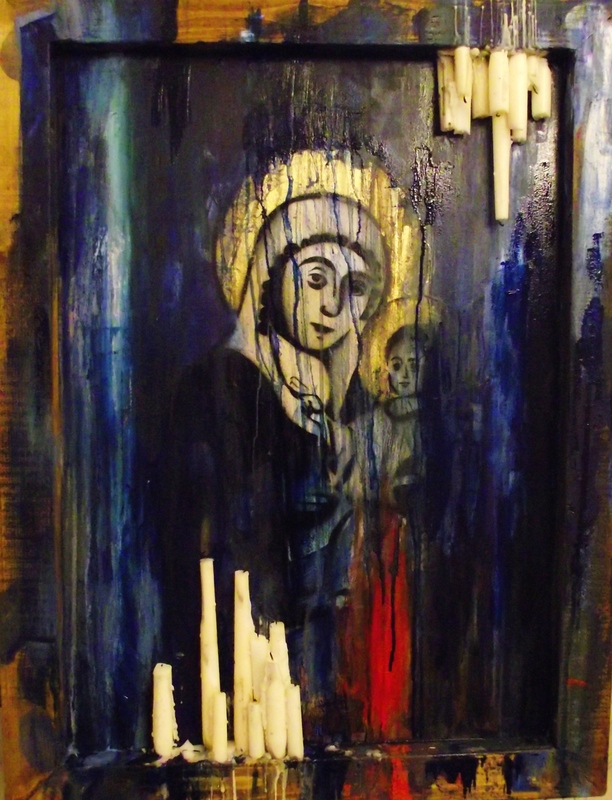 Oil, spray paint, gold leaf and candles on found board. Candles drip and hang like stalactites, upside down and as disconcerting as grief. 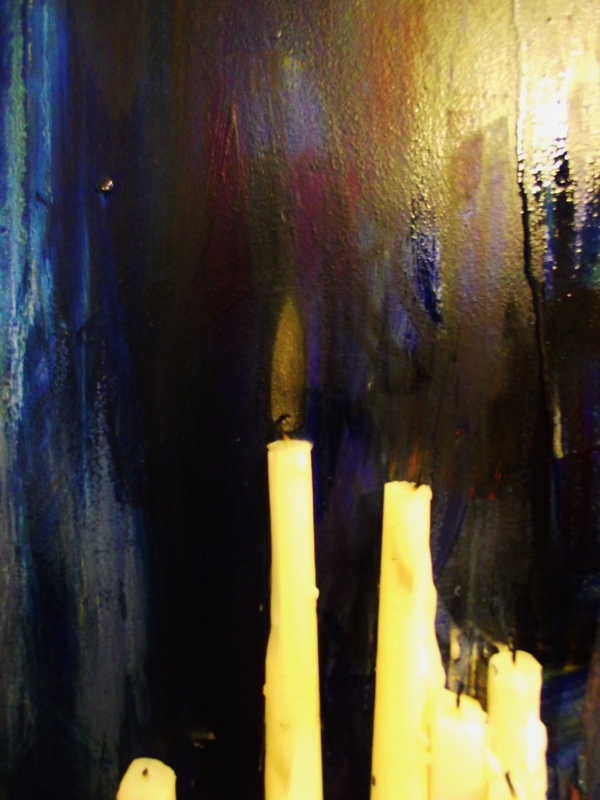 I had to extinguish them quickly when I began to smell the paint burning and I was worried that the whole thing would go up in smoke and now a dark, charred shadow remains where the flame once burned. So many candles burned in memory of those we have lost in Bethlehem, Peshawar, Syria, Ferguson, Didsbury and on and on. 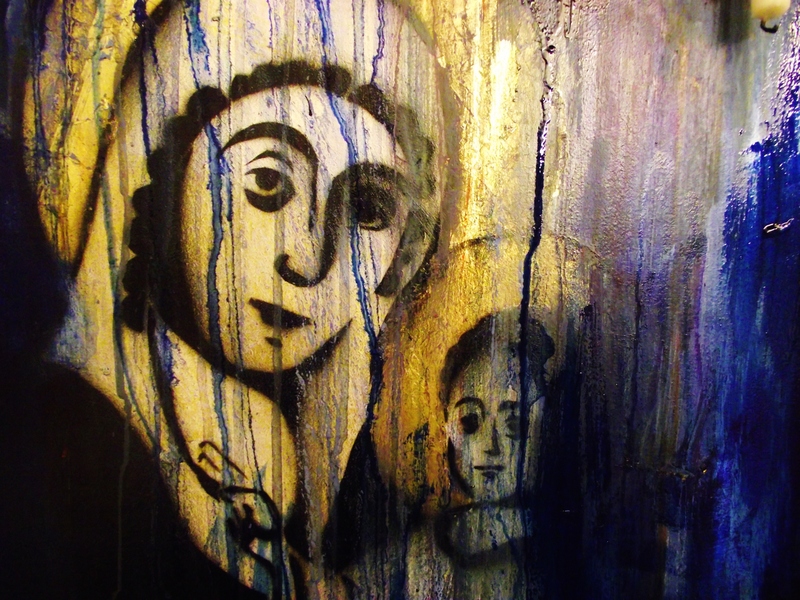 The paint as blue as a nativity play Mary: Ultramarine, Phthalo and Cobalt, runs over the surface of the icon. Rivers of colour form islands of granulated pigment as the paint flows out of my control until it forms a curtain of tears. 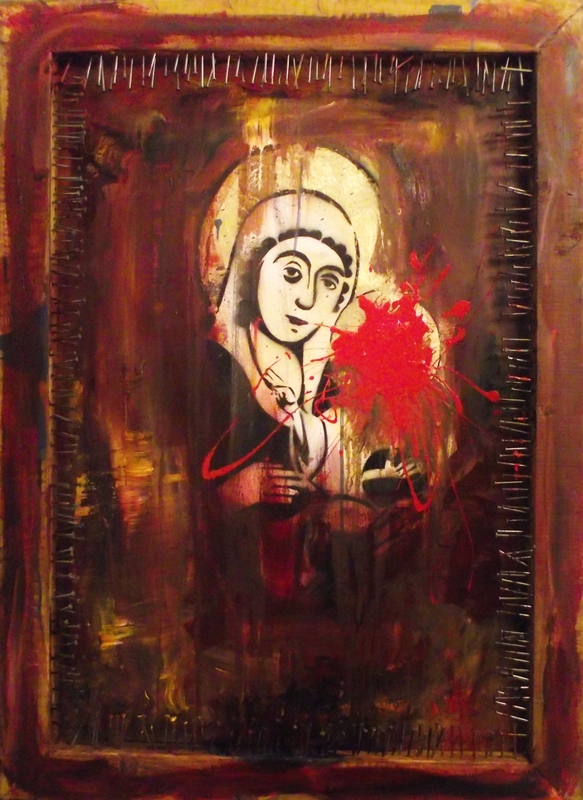 In this final image mother and child are obscured and seen through a veil, but they are united, no wall separates them and no blood red obliterates the child. In this piece of work toy bricks draw the line separating mother and son. It is one of the first things that a child instinctively learns – to claim ownership and declare things as “mine”. And so we go on, drawing lines on maps, building walls to separate what is mine from yours. And sometimes, when the line is drawn then brutality ensues: as border controls are tightened due to the scapegoating of immigrants by press and politicians or concrete walls divide ancient lands. And yet, the Bright Sun still shines, the child’s hand reaches through the wall and the mother’s tears breach it. 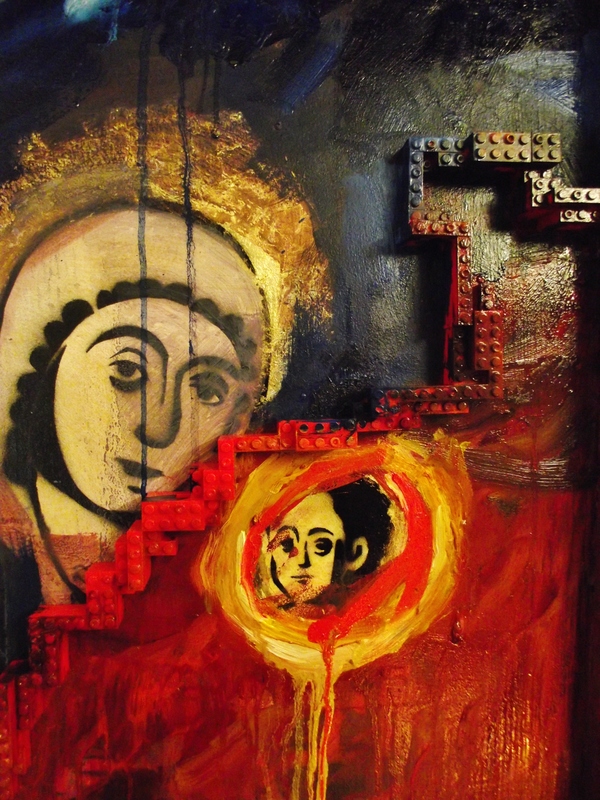 The three pieces I have made for the show are based on an icon of Mary and Jesus from the Church of the Nativity in Bethlehem. Painting over this foundational image I have begun to dig deeper into how the stories I hear from Bethlehem impact my soul. The universe has few more violent acts to inflict on us than the separation of a mother from her child; be it through family circumstance, miscarriage or rocket shells fired onto a beach where boys play football. “A sword will pierce your own soul too” is what the prophet Simeon says to Mary when she takes her child to the temple (Luke2:35). So soon after Jesus’ birth the shadow of what is to come 33years later is already evident. In this image red gloss paint explodes, vibrant as a firework with joyful loops of colour reminding me of a TV serial killer crime scene. 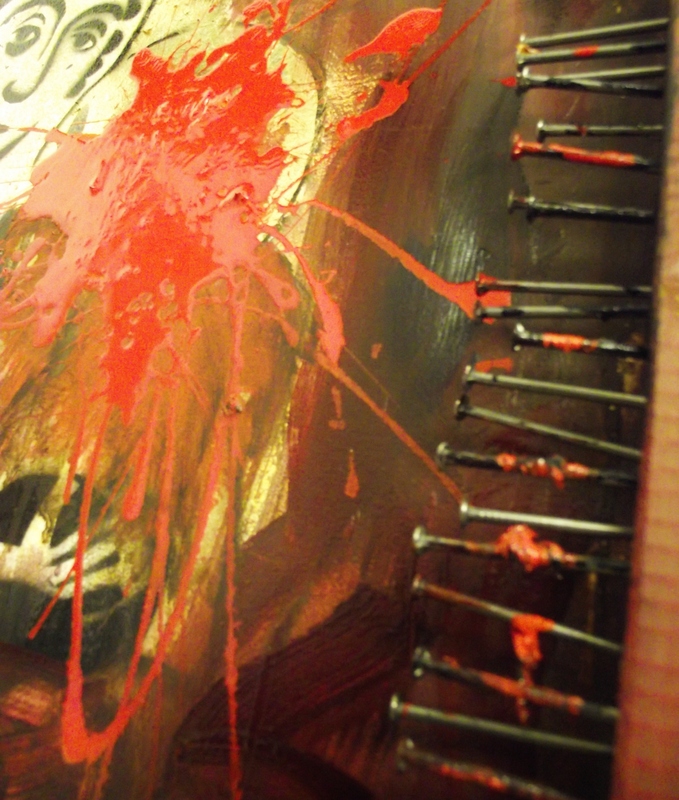 It obscures the child and clods of paint hang on three hundred nails like blood clots. 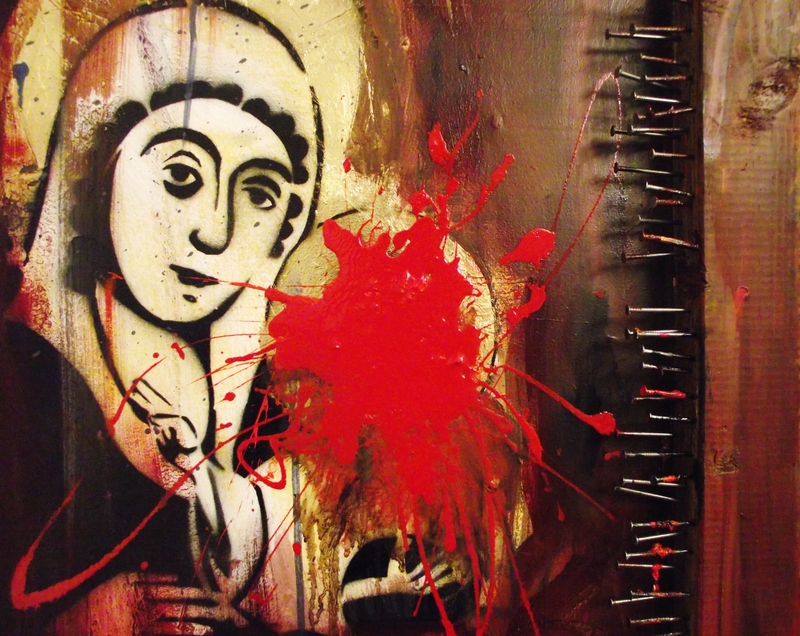 And yet Mother Mary’s smile is serene and her gaze is calm. Perhaps she has found a deeper source of peace or maybe is in denial, misunderstanding the seriousness of the situation. Or could she be one more of the strong women putting on a brave face even though she knows that some wounds are too deep to be soothed with a simple “Let it be”.